Legal information can be complicated, but that doesn't mean it has to be boring or ugly. If you're looking for a break from page after page of double-spaced, 12-point Times New Roman / Courier briefs, or if you're starting to see ghost images of the blue Westlaw header everywhere you go, then feast your eyes on the following articles from the past year that have visually spiced up legal information in appealing ways. Who says you have to compare the laws of different jurisdictions in an oversized, tortured table? Get inspired by the visual journalists at the New York Times, who present some of the most convoluted laws from drastically different countries and states in easily digestible infographics. In How to Buy a Gun in 15 Countries, a lightly annotated step-by-step how-to guide lets the reader compare the gun laws in fifteen different countries without getting bogged down by unnecessary legalese. In What It Takes to Get an Abortion in the Most Restrictive U.S. State, side-by-side flow charts of the steps required to get an abortion in California and Mississippi visualize the many differences in legal restrictions you might face depending on what state you live in. Rule 33 of the Rules of the Supreme Court of the United States might require a "clear, black image on white paper," but that shouldn't stop you from adding splashes of color to articles about our most distinguished court. 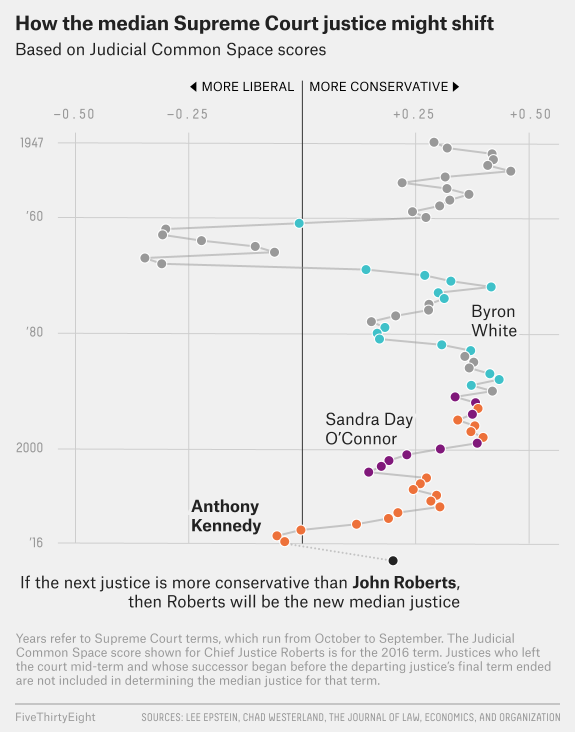 In How Kavanaugh Will Change the Supreme Court, bright turquoise, purple, and orange dots are used to represent various ideological "median" Supreme Court justices over the years based on their Judicial Common Space scores, with data collected from an article published in the Journal of Law, Economics, and Organization. While it can be easy to get lost in the sheer quantity of legal information, good visualizations will find a way to highlight important trends without neglecting the individual data components that make up the information. In An Unequal Justice, the reader can scroll through the names of nearly 26,000 homicide victims whose murderers haven't been arrested, and sees highlighted the disproportionate number of those names that belong to the victims who are black. This interactive graphic brings out the human side of tens of thousands of criminal homicides without letting the reader overlook racial disparities in the data. 4. 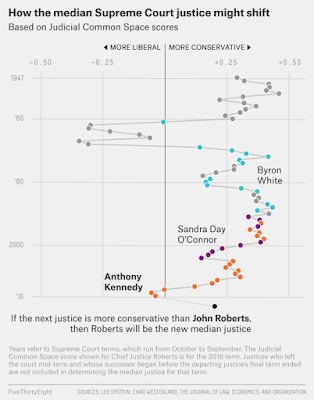 More Visualizations in Law! Can't get enough legal infographics and interactive visuals? Check out the examples at Open Law Lab's Visual Law Project and the Legal Design Labs' Visual Law Library. For those looking for a more organized list of resources, Margaret Hagen has compiled a helpful Beginner's List of Links for Those Interested in Visuals + Law over at the Open Law Lab's blog. Isn't it great when you can find a good, fact-based non-partisan analysis of some issue or program? HeinOnline just released a new database, GAO Reports and Comptroller General Opinions. The General Accountability Office (formerly General Accounting Office) "is an independent, nonpartisan agency that works for Congress. Often called the 'congressional watchdog,' GAO examines how taxpayer dollars are spent and provides Congress and federal agencies with objective, reliable information to help the government save money and work more efficiently." The GAO is headed by the Comptroller General. Unlike many administrators, who come and go with presidential administrations, the Comptroller General has a 15-year term, giving the agency continuity. You could find a lot of these reports on GAO's own website, but HeinOnline gives you faster and more flexible searching and sorting. It's much easier to work with. While you policy wonks are exploring HeinOnline, take a look at the U.S. Congressional Documents library. It includes Congressional Budget Office documents, CRS Reports, and more. It might be this quarter. It might be on the MPRE or on the bar exam, but at some point in the near future, you're going to be faced with yet another multiple choice test. Given all the multiple choice tests you've taken in your academic career up until now, you're probably a pro at process of elimination. Awesome! But what happens when you get down to two equally tempting answer choices? Or worse, when all of those answer choices look good? Let's take a step back and think about how a multiple choice test works. For a multiple choice question to work, there must be a correct answer, even if that answer is "None of the above." Ambiguities have no place in multiple choice; that's for essays or short answers. What makes a multiple choice question difficult are those pesky three or four "trap" answer choices that seem to be saying all the right things. All of that noise slows you down and can make you second guess yourself. But what if you could side step those traps? Try to articulate the right answer to the question before you look at the answer choices. You're smart. You studied for this test. Based on the information given to you in call of the question, you should be able to formulate what the correct response is without needing to refer to the answer choices. Once you know what the right answer should be, you will be more likely to spot it among the traps. 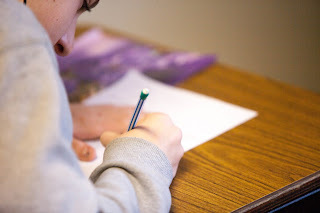 This method can take a little bit of practice since many of us are accustomed to diving right into the answer choices when taking a test. Try this strategy out on sample MBE questions or on a CALI lesson (login required) before your next to test to see if it works for you! For more resources, check out our guides on Law School Exams and the Washington State Bar Exam. Did the snow keep you from shopping for Valentine's Day cards? 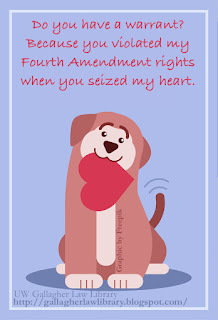 Check out the law-related Valentines a few of our law library interns prepared last year. They're just as clever this year! In anticipation of significant snowfall the Gallagher Law Library will be closing early on Friday (2/8) at noon and will be closed through Sunday. Refer to UW alerts, the law library home page, Facebook or the blog for any further updates on closures. Thank you for your understanding.